website or portal apart from this portal is considered a FRAUD. Any candidate who visits any other website does it at his/her own PERIL. 1. Nationality: Applicant must be of Nigerian origin. 4. Height: Minimum height is 1.68 meters or 5.5ft for males and 1.65m or 5.4ft for females. 6. Non-Tradesmen/women: Applicants must possess a minimum of 3 credits including Mathematics and English Language in SSCE/NECO/GCE obtained not later than 6 years to this exercise. In addition, applicants are also required to possess their school's testimonials. 7. Tradesmen/women: Applicants must possess OND, NABTEB, RN/RM or City & Guild Certificate. Candidate with only Trade Test Certificate are required to also have a minimum of 3 passes in GCE/SSCE/NECO including English. In addition, applicants applying as tradesmen/tradeswomen must possess ND (with minimum of Lower Credit) or other relevant trade qualification from government-approved institutions. 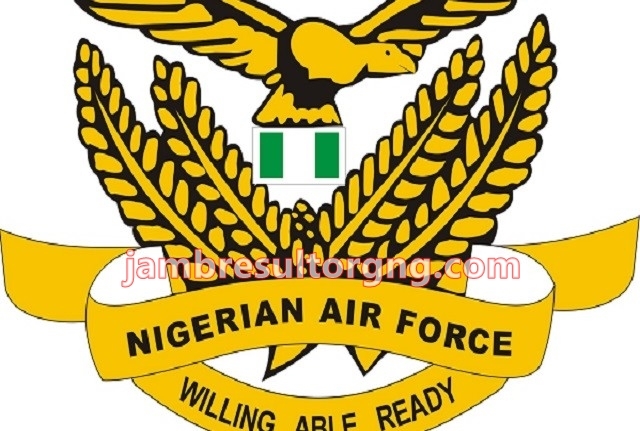 Note that applicants with HND or First Degrees/Post-Graduate Certificates, University Diplomas and Grade II Teacher's certificates will not be considered for recruitment as airmen/airwomen into the Nigerian Air Force and should not apply. 8. Attestation Forms: Applicant's attestation form must be signed by a military officer from the same state as the applicant and not below the rank of Squadron Leader or equivalent in the Nigerian Army and the Nigerian Navy, and Police Officer of the rank of Assistant CP and above. Local Governments Chairmen/Secretaries, magistrates and principals of government Secondary Schools from applicants' state of origin can also sign the attestation forms. The signees passport photograph and either photocopy of drivers licence or international passport must be attached. In addition, applicants are to bring with them a letter of attestation of good character from any of the officers above to the Zonal Recruitment Centers and final selection interview. 1. Medical Records: ND Medical Records. 3. Lab Technician: ND Medical Lab Science. 4. X-Ray Technician: ND X-ray Technology. 6. Pharmacy Technician: ND Pharmacy Technology. 7. Environmental Technician: ND Environmental Technology. 8. Biomed Technician: ND Biomed Technology. 9. Optometry Technician: ND Optometry Technology. 11. Assistant Chaplain: ND Christian Religious Study. 12. Assistant Imam: ND Arabic/Islamic Studies. 13. Engineering Technicians: ND Mechanical Engr./Electrical Electronics Engr/Air Engineering Technology. 14. Meteorologist: WMO Class III Meteorology Assistant Certificate. 15. Domestic Electricians: ND Electrical Electronics, ND/Trade Test Cert 1,2,3 Domestic Elect, Work. 16. Building Technology: ND Building tech/QS/Land Surveying/Civil Engineering. 17. Public Relations/Info: ND Mass Comm. Cert/Trade Test Cert in Videography/Photography. 18. Secretarial Assistants: ND Office Technology Management. 19. Library Assistants: ND/NCE Library Science. 20. Music: ND Music. In addition, playing experience in any recognised Band will be an advantage. 21. Driver/Mechanic: Trade Test and current driver's license with practical experience. 22. Works: Trade Test Cert in Welding/Carpentry/Painting/Sign Writing/Plumbing/Mason/domestic Electrician/Refrigeration and Air Conditioning. 23. Computer Tech: ND/Computer Hardware Engr/Software Engr. Possession of recognized certifications will be an advantage. 27. PE/Sports: ND/NCE Physical Education, Certificate of participation/Medals in National and International sporting competitions will be an added advantage. 28. Catering: ND in Catering Services. 29. Education: NCE Physics, Chemistry, Biology, Mathematics, English, Home Economics, Nigerian Languages, French, Business Management, Fine Art. 1. Makurdi: Nigerian Air Force Base, Markudi. 2. Ilorin: 227 Wing, Nigerian Air Force, Ilorin. 3. Lagos: Sam Ethnan Air Force Base, Ikeja - Lagos. 4. Enugu: 305 Flying Training School, Enugu. 5. Port Harcourt: 97 Special Operations Group, Nigerian Air Force, Port Harcourt. 6. Benin: 81 Air Maritime Group, Nigerian Air Force Benin. 7. Kaduna: Nigerian Air Force Base, Kawo - Kaduna. 8. Kano: 303 Flying Training School, Kano. 9. Maiduguri: 204 Wing, Nigerian Air Force Base, Maiduguri. 10. Ipetu-Ijesha: Nigerian Air Force Institute of Safety, Ipetu-Ijesha. 11. Sokoto: 55 Forward Operation Base Mabera, Sokoto. 12. Yola: 75 Strike Group, Nigerian Air Force, Yola. 13. Jos: 330 Nigerian Air Force Station, Jos. 1. Two recent passport size photographs to be stamped and countersigned by officer of appropriate rank specified, Local Government Chairmen/Secretaries and other specified officers in Paragraph 8.
a. Birth Certificate/Declaration of Age (Any age declaration done later than 4 years to this exercise will not be acceptable). c. Indigenship certificate from applicant's State of Origin. 12. Any applicant suspected to have impersonated or submitted false document(s) shall be disqualified from the selection exercise. Also, any false declaration detected later may lead to withdrawal from training. Such applicants may be handed over to the Police for prosecution. 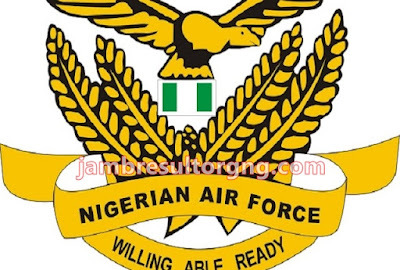 The Nigerian Air Force will not entertain any enquiries in respect of applicants whose applications have been rejected. Interested applicants are to note that the online registration is free of charge. Applicants are required to fill valid email addresses and Telephone numbers in the appropriate spaces provided in the application form.